Authorities in Sonoma County are keeping their eyes on a stubborn elephant seal that tried to cross Highway 37 several times on Monday. SEARS POINT, Calif. -- Authorities in Sonoma County are keeping their eyes on a stubborn elephant seal that tried to cross Highway 37 several times on Monday. At one point, the nearly 1,000-pound mammal was in the median with cars stopped around it. That elephant seal caused a huge traffic jam for more than a mile in both directions on Highway 37. As of 11 p.m., it was beached in the mud, just off the shoulder of the highway, looking either distressed or too tired to do anything after a long day of trying to cross the road. It stayed there after the tide rolled back into the San Pablo Bay. Earlier, CHP Officer Andrew Barclay says he got a face-full of hot breath and saliva while trying corral this extremely irritated mammal. Barclay said the elephant seal had "a lot of weight behind her and a lot of muscle. So she was moving us pretty easily, a lot of force." 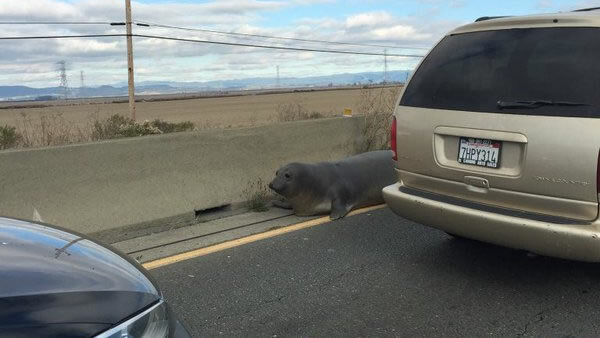 The elephant seal hopped out of San Pablo Bay around 1 p.m., scooted its way in front of eastbound Highway 37 traffic and tried to crawl over the median. Barclay and the others coaxed her back into the estuary. "What we've seen is she's obviously still trying to get out of the water. She's very adamant she's going to cross this stretch of roadway," Barclay added. The determined elephant seal made three more attempts. Marine mammal experts say she may be trying to get to the dry field on the other side because she is about to give birth. "If she is about to give birth that means she is in her prime. So she's got a lot of weight, she's got a lot of strength on her, she could tear the board away from your hands if you don't hold it the proper way," Barbie Halaska from the Marine Mammal Center said. The angry elephant seal took a gash out of the wooden board Barclay was holding. The CHP and the Marine Mammal Center say they will be monitoring it throughout the night.